Watermark Living™ carries over 250 fabrics in house for buyers to choose from that will fit any motif or decor. Our designers take meticulous time making certain that these fabrics are up to trend along with keeping a traditional selection as to suit any needs. In keeping with the attention to detail below you will find our care and maintenance of these fabrics both indoor and outdoor. For spot cleaning, use a mild pure solvent (such as Carbona® or Simple Green®) and work in a well-ventilated room. Avoid any product containing carbon tetrachloride, as it is highly toxic. Always pre-test cleaning agents on a hidden area. Wait until the fabric dries to confirm that fabric is colorfast prior proceeding. Solvents must be properly used or there may be a "clean spot" or a noticeable ring left on the fabric. Before beginning, assemble required supplies (listed above). Place cotton cloth/paper towels beneath the stain (if possible). Apply cleaning solvent to another towel or rag (do not apply solvent directly to cushion). Promptly dab onto the stain, do not rub as this may cause the fabric to show wear more quickly. Dry immediately with the hairdryer to reduce the chance of the dyes running or leaving a “clean spot” (suggested). This process may need to be repeated in order to remove stain completely. NOTE: Below is a chart of our fabric cleaning codes. 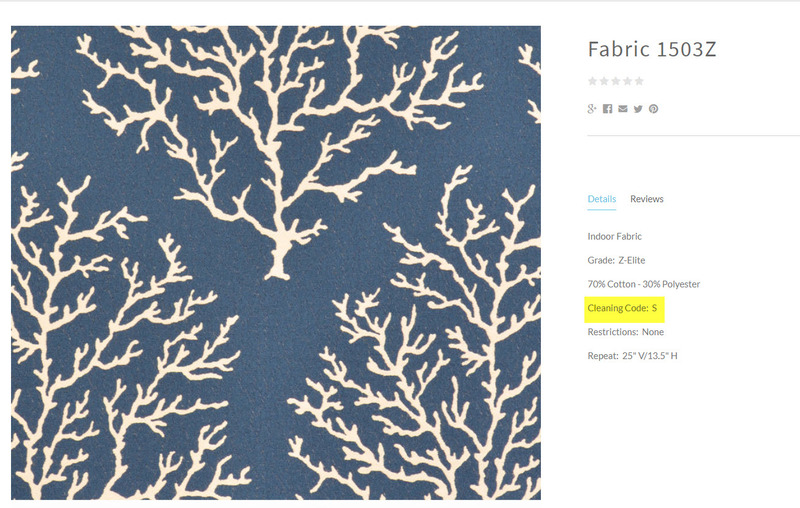 You can search your fabric on our site and within the description there is a cleaning code. This cleaning code can then be cross-referenced to the chart to find out what cleaning agents you can use on the fabric. W Water Base Water base cleaning agents or water based foam may be used to clean this fabric. Many household agents are harmful to the color and life of a fabric. Professional cleaning is encouraged. S Solvent Cleaners Petroleum distillate base only may be used to clean this fabric. Water based detergent based solvent cleaners may cause excessive shrinkage. Water stains may not be removable and may become permanent. Professional dry cleaning is encouraged. SW Water Based or Solvent Water base cleaning agents, water based foam, or petroleum distillate base clears can be used to clean this fabric. Professional cleaning is encouraged. X Use Nothing Use nothing but a light brush or vacuuming to clean this fabric. Any type of water based or solvent based cleaning agent may cause fading or excessive shrinking. Water stains may not be removable and may become permanent. After a soaking rain or anytime the cores of the cushions get wet it is best to stand the cushion on end to allow them to drain more quickly. This will prevent mold and mildew growth between the frame and the cushion. Spot wash the fabric to clean spills by using a sponge or a soft bristle brush with a warm soapy solution of mild detergent (Joy® or Ivory® liquid). Brush or sponge the soiled area and rinse thoroughly with fresh water. Allow to air dry. Repeat if necessary. If and ONLY IF your cushion is made from 100% solution dyed acrylic such a Sunbrella®, you may use one part bleach mixed with one part water and a mild dish soap to clean your cushions. Be sure to rinse the cushion thoroughly to remove all of the bleach solution. One of the best ways to keep Sunbrella fabrics looking good and to delay deep or vigorous cleaning is to properly maintain the fabrics. This can be accomplished by simply brushing off dirt before it becomes embedded in the fabrics, wiping up spills as soon as they occur or spot cleaning soon after stains occur. Most stains can be removed from Sunbrella fabric with mild soap and lukewarm water. First blot the excess stain residue. Mix mild soap and lukewarm water and remove the stain with a sponge or soft bristle brush. Be sure to rinse thoroughly to remove all soap residue and then allow the fabric to air-dry. If the stain is still visible, blot excess stain residue. Mix 1 cup of bleach and 1/4 cup of mild soap per gallon of lukewarm water and rmeove the stain with a sponge or soft bristel brush. Rinse thoroughly and allow to air-dry. For detailed cleaning instructions, visit Sunbrella's CLEANING PAGE , which boasts a feature to search by stain to solve your issue. Outdura® fabric should be cleaned regularly to prevent excessive dirt from accumulating. Simply brush off any loose dirt and rinse with lukewarm water. To clean, use a solution of lukewarm water (not exceeding 100 degrees Fahrenheit) and a mild natural soap such as Lux® or Ivory®. Rinse thoroughly to remove excess soap. For more difficult stains, please refer to their care and CLEANING CHART for treatment.